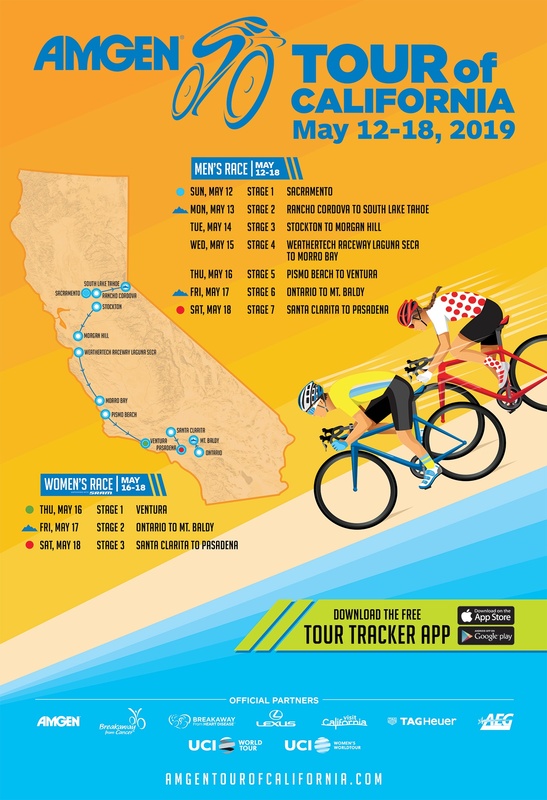 The 2019 Amgen Tour of California will cover a variety of terrain showcasing many of California’s most well-known and iconic settings and landmarks allowing different types of specialists in the peloton to shine throughout the week. With several fast and flat sections on tap in Sacramento, Morgan Hill and Pasadena catering to sprinters (not to mention a start overlooking the famous WeatherTech Raceway Laguna Seca ), climbers will face challenges in South Lake Tahoe, the Diablo Mountain Range outside Stockton where they will reach an elevation of 4,625 feet, and on multiple climbs between Pismo Beach and Ventura. Fans and teams alike will count down to the men’s and women’s Queen Stages from Ontario to Mt. Baldy, which will feature a grueling 26-mile fan-favorite climb to the summit finish, a day that will shake up the leaderboard and can make or break the quest for the overall victory.